This article will provide the comparison of Internet security packages G Data Antivirus and ESET NOD32 Antivirus. Both of the software packages are praised by consumers and experts. G DATA is known for creating one the very first antivirus software programs in 1985 and being one of the first companies to enter the market, while ESET offers one of the best-rated and powerful anti-virus and firewall products. G DATA Antivirus was developed by a German-based software company G DATA Software AG. The company is one of the eldest in security software industry. G DATA developed its first Antivirus Solution in 1985. G DATA is one of the leaders in the market and provides quality security technologies and antivirus products to customers in over 90 countries across the globe. G DATA Offers security for Windows, macOS and Android devices, and also businesses and large enterprises. G DATA Antivirus not only detects threats on your computer but also protects your computer from getting them in the first place. 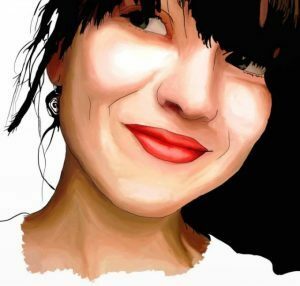 Researchers at Reviewed by Pro tested the software for about 30 days in a row, in order to reveal its main pros and cons. Not expensive in comparison with other quality experienced software. Modern and professional looking user interface provides users easy and smooth operating experience. The software looks powerful: full scans detect even the smallest pieces of malware. It is also possible to scan only selected locations and external devices, including USB flash drives, different hard disks and more. The software has a noticeable impact on the operating system and a full scan really slows down the performance. The software is not flexible enough and only offer a full scan which also is very slow. The full scan can take up to two hours, while many of its competitors are able to complete a full scan in under half an hour. The antivirus is not capable of protecting a computer from ransomware. That means that if you want to be fully protected you have to consider using different antivirus software together with G DATA Antivirus. G DATA receives many reviews about their products. Many users indicate that the negative side of the software is lack of a quick scan and a protection against ransomware. Although, the majority of users are happy with G DATA Antivirus. The software is easy to download. 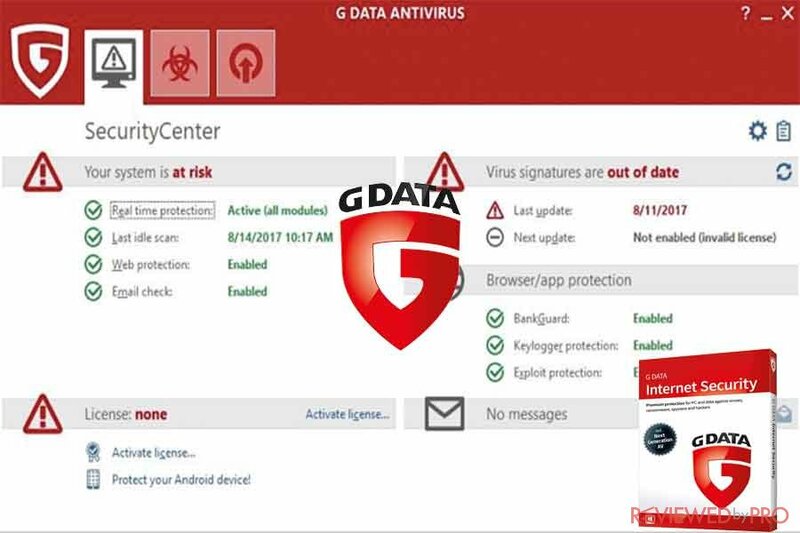 G DATA Antivirus supports Microsoft Windows 7, 8, 8.1, 10, Android 4.0 and later, and macOS 10.7.5 and later platforms. After a 30-day test of the software, researchers came up with the final verdict. ESET NOD32 Antivirus is created by ESET, IT security company based in Slovakia. The company provides high-quality Internet security and antivirus software since 1992. Today ESET security solutions are available for individuals and businesses in over 200 countries and territories. In addition, NOD32 is one of the most recognized security software praised by anti-malware critics. Researchers team at Reviewed by Pro used the antivirus for approximately 30 days. After the test, researchers team disclosed its’ main pros and cons. ESET NOD32 has one of the highest virus detection and removal rates. The software detected and removed almost all of the threats and malicious virus samples on the test computer. ESET NOD32 was also rated with the highest security level (AAA) by SE Labs. The antivirus demonstrated one of the best anti-phishing systems on the market and gets rid of the threats pretty quickly. Real-time protection results are pretty decent. If your computer gets infected while you are using ESET NOD32, all services and virus removal are totally free. The technicians’ team at ESET are very helpful and operates very quickly. Researchers noted that the user interface is attractive and convenient no matter if you are an advanced user or a beginner. The antivirus missed some adware and left some active icons on the desktop of removed threats. When it comes to resources usage, ESET NOD32 scored average rates, the boot time takes a bit longer than the similar software. If you got infected before ESET NOD32 was installed, you will have to pay an additional fee to remove a threat. The software download is quick and easy due to a small size of the program. Systems that are compatible with the ESET NOD32 application include Microsoft Windows 10, 8.1, 8, 7, Vista, and Microsoft Windows Home Server 2011. After using the software for about a month, researchers came up with the final verdict. Simple but quality G DATA Antivirus software would be a great every-day choice for the average user. It detects even he smallest pieced of malware and provides useful unique features. However, it has no ransomware protection, so you won’t be secured 100% unless you have another Internet security application working together with G DATA Antivirus. 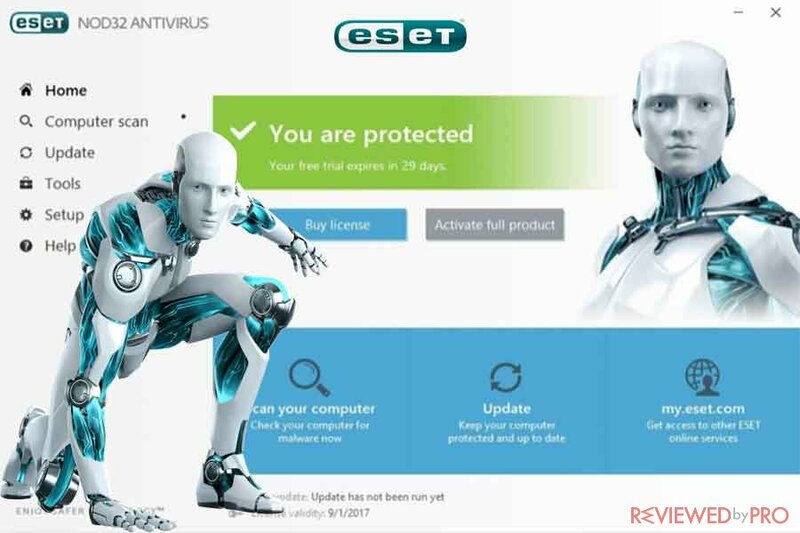 If you are looking for the highest-quality software that provides perfect rates at malware detection and removal, one of the best anti-phishing and real-time protection systems we definitely would recommend you ESET NOD32. The software is also easy to use and offers helpful customer support. ^ G DATA AntiVirus. G DATA Software. ^ Gabriel E. Hall. 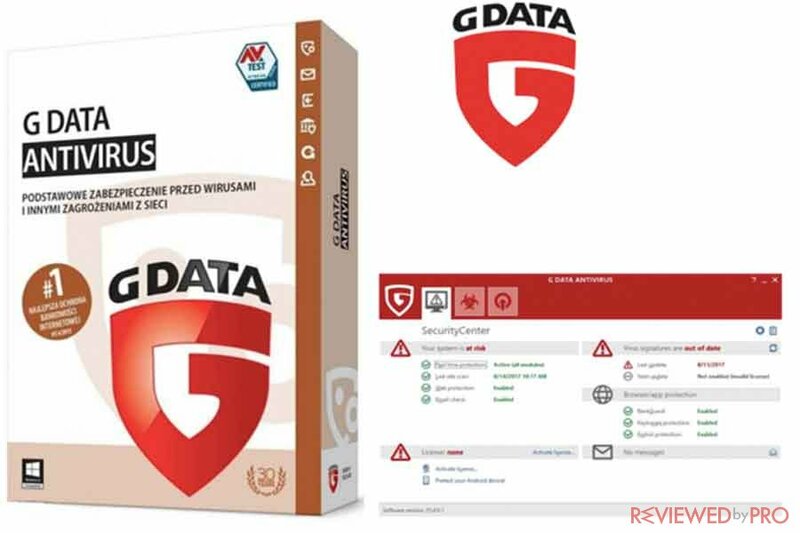 G DATA AntiVirus Review. Reviewed by Pro. ^ Award-winning antivirus for Windows. ESET. ^ Lucia Danes. 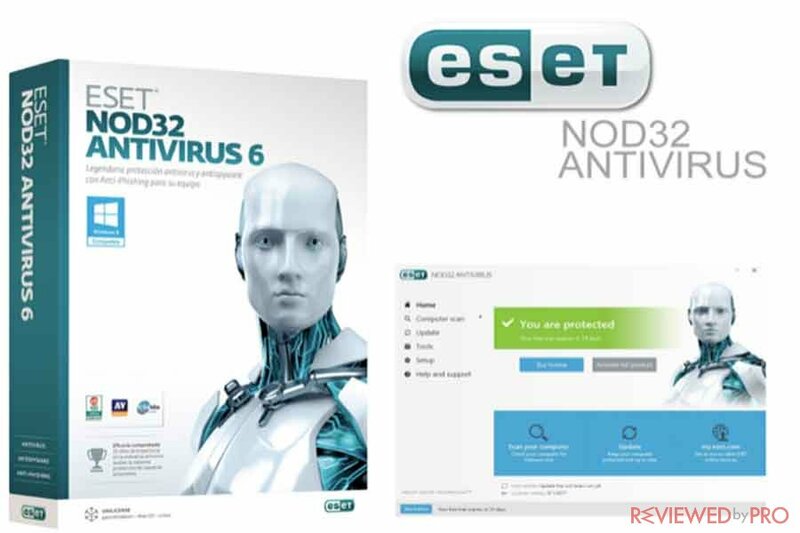 ESET NOD32 AntiVirus Review. Reviewed by Pro. This entry was posted on 2019-01-16 at 02:25 and is filed under Security.